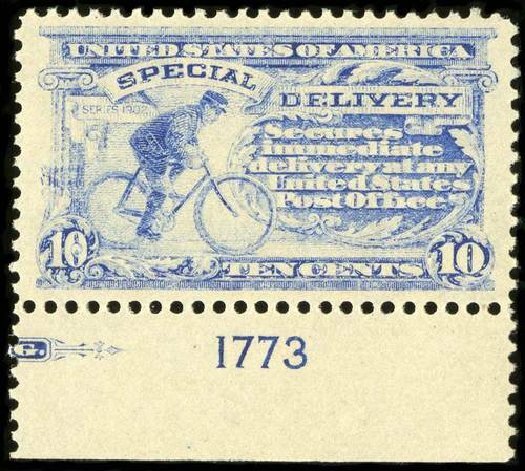 USA (Scott E6) 1902 BICYCLE 10¢ ULTRAMARINE, PLATE SINGLE Bottom plate #5244, original gum, lightly hinged, faint tone spot in selvage, otherwise fresh, very fine. Cat price $230. 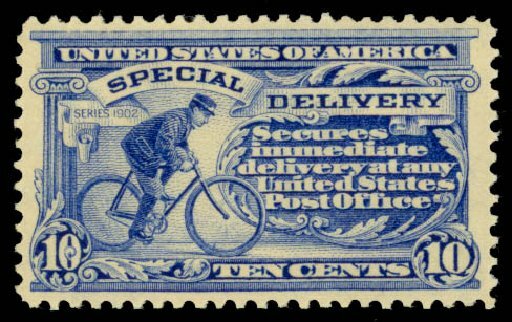 USA (Scott E6) 1902 BICYCLE 10¢ ULTRAMARINE Choice stamp, fresh, MINT never hinged, incredibly well centered, extremely fine. (2014 PSE Cert #01282555) Cat $525. 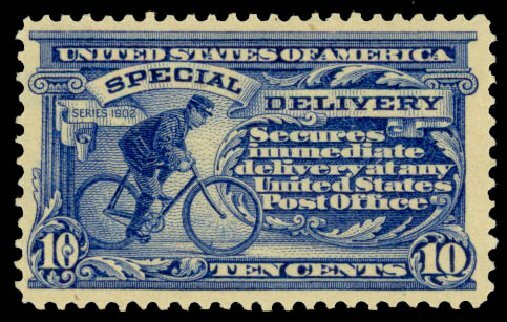 USA (Scott E6) 1902 BICYCLE 10¢ ULTRAMARINE Fresh, MINT never hinged, fine to very fine. (2002 PSE Cert #00082132) Cat $525. 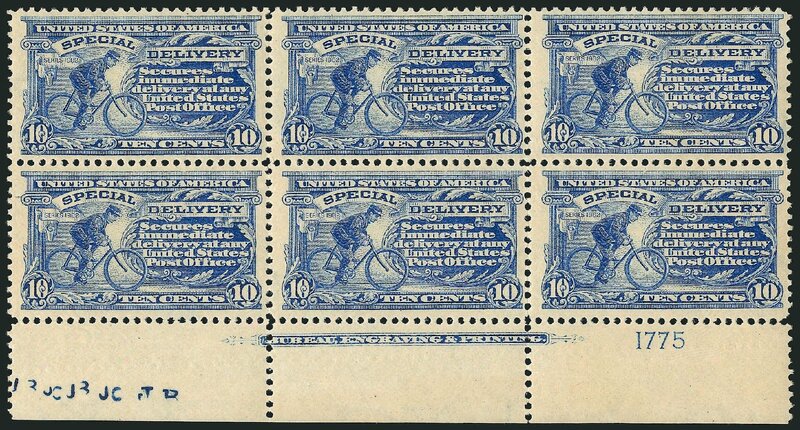 Scott #E6, 10c Ultramarine, bottom plate no. 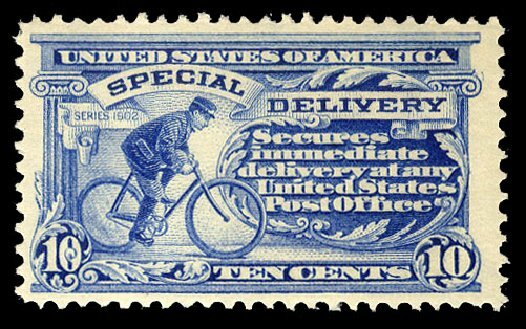 1173 mint single, unusually well centered and margined, lovely pastel color, o.g., lightly hinged, choice very fine; 2015 PSAG certificate. 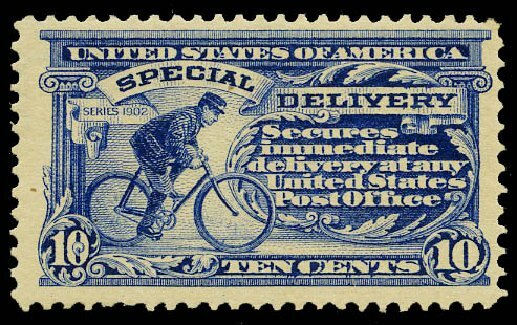 United States – Special Delivery 1902 10c ultramarine, n.h., v.f., with 2013 PSE cert. 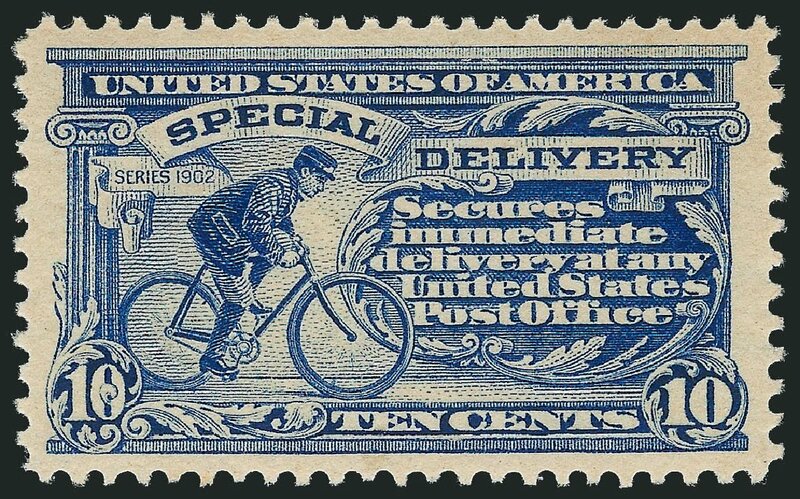 Special Delivery, 1902, 10¢ ultramarine (Scott E6), o.g., previously hinged, extremely intense color, much deeper and richer than normaly found on this issue, Fine to Very Fine. 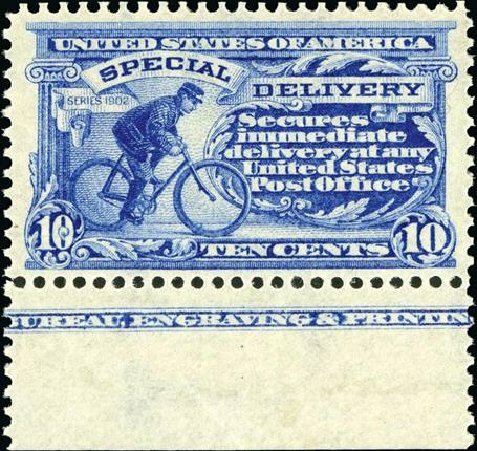 Scott $230. Estimate value $100 – 150. 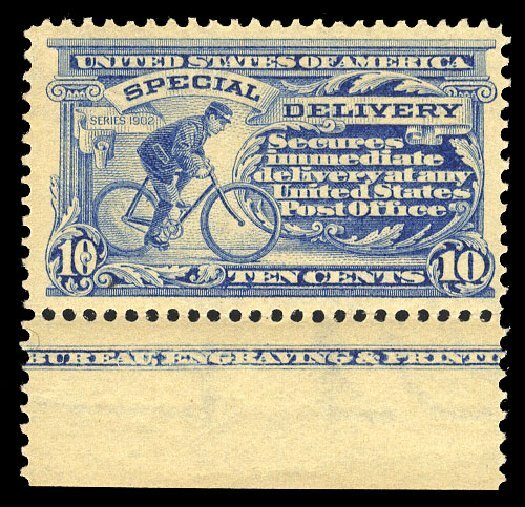 Special Delivery, 1902, 10¢ ultramarine (Scott E6), top margin single with plate number, o.g., barest trace of hinge (appears never hinged), brilliant color, the stamp just barely “touched” by hinge mark in the selvage that touches a couple perfroations of the stamp itself, Fine to Very Fine. Scott $230. Estimate value $150 – 200. 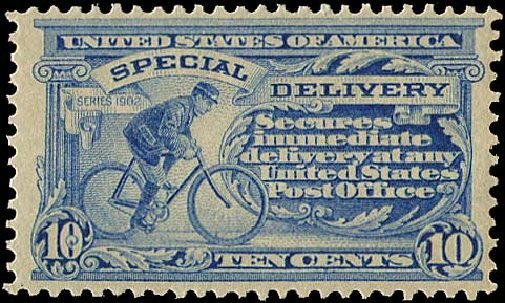 Special Delivery, 1902, 10¢ ultramarine (Scott E6), o.g., never hinged, handsome example of this terribly difficult set in immaculate mint condition, Very Fine. 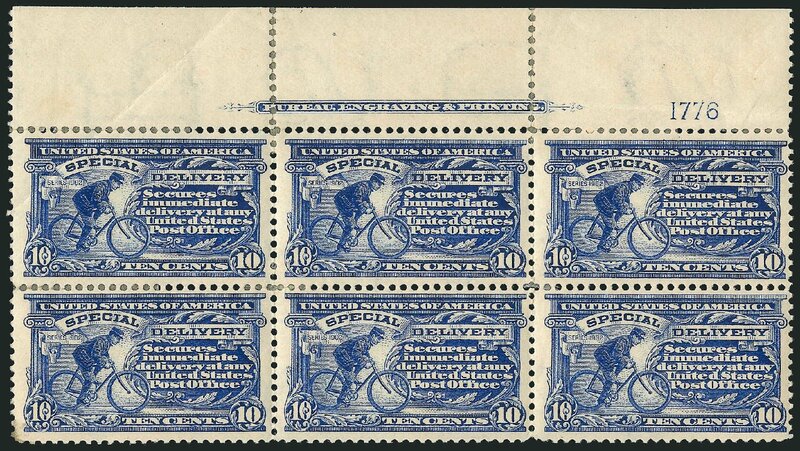 Scott $525. Estimate $350 – 500. 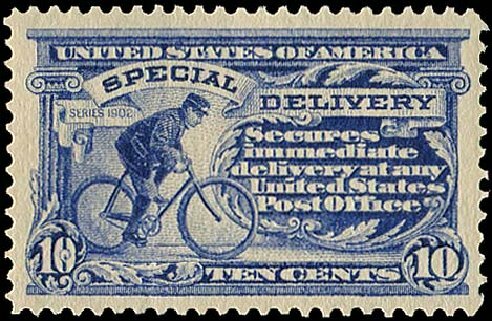 Special Delivery, 1902, 10¢ ultramarine (Scott E6), o.g., never hinged, gorgeous mint stamp with a fantastic shade of blue, the deepest and richest color you’ll ever see on this difficult issue, Fine to Very Fine, 2014 P.F. certificate. 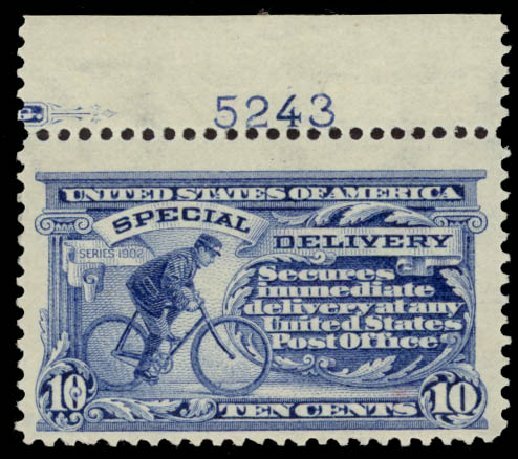 Scott $525. Estimate $200 – 300. 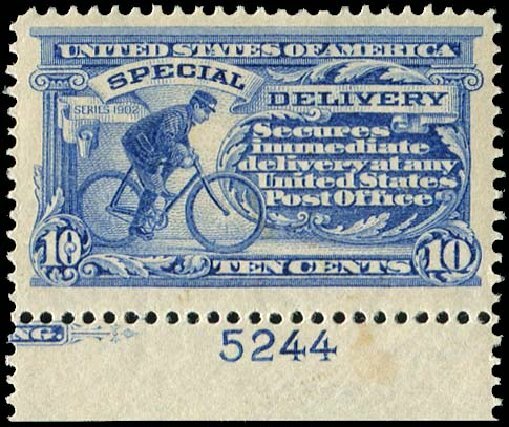 Scott #E6, 10c Ultramarine, bottom partial imprint single, especially well centered within wide margins, brilliantly rich color and an unusually strong impression, o.g., n.h., an extremely fine example of one of the most difficult special delivery stamps to find in premium quality; 2014 PF certificate. 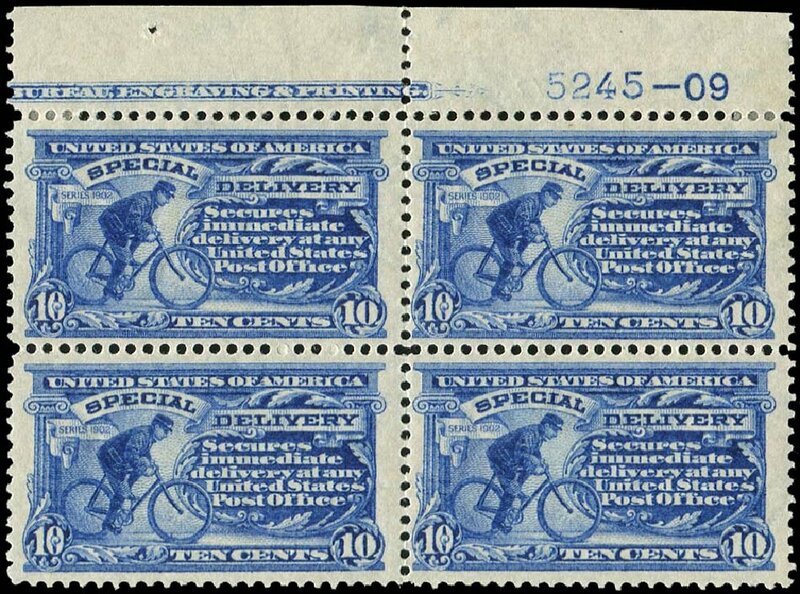 USA (Scott E6) 1902 BICYCLE 10¢ ULTRAMARINE, RE-ISSUE BLOCK Top margin block of 4, part imprint and re-issue plate #5245-09, beautiful deep rich color, unused, no gum, fine to very fine. Cat for OG singles. Cat $920.